You've decided to start walking for health and fitness, and now you need a plan to build your walking endurance and speed. As a beginner, you should focus on using good walking posture and technique as you steadily build your walking time. Brisk walking for 30 minutes per day, totaling 150 minutes per week, is recommended by health authorities to reduce your health risks for heart disease, stroke, diabetes, and other conditions. Brisk walking for a total of five hours per week is associated with maintaining weight loss and even greater health benefits. For this reason, you should build up to walking for an hour a day, most days of the week. You can build a walking habit by walking at least five days per week and tracking your walks. If you have an ongoing health condition, talk to your doctor before starting any new exercise program. Start each walk by checking your walking posture. You will want to walk at an easy pace for a couple of minutes before you speed up. Wear flexible athletic shoes and comfortable clothing. You can do your walking outdoors, indoors, or on a treadmill. Week 1: Start with a daily 15-minute walk at an easy pace. Walk five days the first week. You want to build a habit, so consistency is important. Spread out your rest days, such as making day 3 a rest day and day 6 a rest day. Weekly total goal: 60 to 75 minutes. Week 2: Add five minutes a day so you are walking for 20 minutes, five days a week. Or, you may wish to extend yourself more on some days, followed by a rest day. Weekly total goal: 75 to 100 minutes. Week 3: Add five minutes a day so you are walking for 25 minutes, five days a week. Weekly total goal: 100 to 125 minutes. Week 4: Add five minutes a day to walk for 30 minutes, five days a week. Weekly total goal: 125 to 150 minutes. Snags: If you find any week to be difficult, repeat that week rather than adding more time. Do this until you are able to progress comfortably. Graduate: Once you are able to walk for 30 minutes at a time comfortably, you are ready to use a variety of different workouts to add intensity and endurance. A weekly walking workout plan includes walks with higher-intensity intervals, speed-building walks, and longer walks. How Fast Should Beginners Walk? Walkers should aim for a brisk walking pace to achieve a moderate-intensity walking workout. 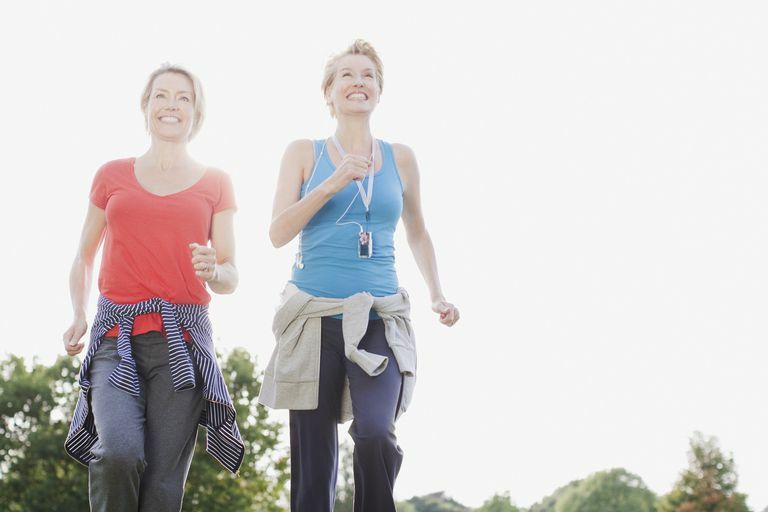 That is the exercise intensity that is associated with the best health benefits of walking. Moderate intensity is usually associated with walking a mile in 20 minutes or less, at a target heart rate of 50 to 60 percent of your maximum heart rate. Your breathing is heavier than normal. You are still able to carry on a full conversation while walking. You are not out of breath. Don't worry if your speed is slower and heart rate lower during the initial weeks. Your first goal is to be able to walk for 30 to 60 minutes a day without injury. You will add speed and intensity later. Be consistent in how often and how far you walk before you try to walk faster. You are likely to discover that using good walking posture and arm motion will result in walking faster. If at any time during the walk you are experiencing difficulty, slow down further and return to your starting point. Be aware of warning symptoms of problems such as heart attack or stroke and seek medical assistance if needed. It is recommended that you increase your exercise time and intensity by no more than 10 percent per week. Once you have built your walking time and speed you are ready to have some fun. You can train for a 5K walk, which is 5 kilometers or 3.1 miles long. This is a popular distance for charity walks and fun runs and will take 45 minutes to an hour to finish. You can begin training to enjoy these events once you have built up to walking 30 minutes per day, five days per week. You may also want to join a walking group or club so you will have others to walk with and incentive to keep going with your new walking.habit. How Much Physical Activity Do Adults Need? Centers for Disease Control and Prevention. https://www.cdc.gov/physicalactivity/basics/adults/index.htm.